Click here to see Crawfish Cookers that we have in stock! This crawfish cooker requires a HIGH-PRESSURE regulator. Now available in 2 sizes, the small cooker can hold 1 bag and is more ideal for shrimp, fish frys, crabs, and lobster while the large can hold up to 70 lbs and is more ideal for crawfish. Down south, crawfish season is one of our favorite times of the year! Nothing beats the delicious smell of seasoned to taste crawfish mixed with potatoes, corn on the cob or whatever else you want to throw in to make it your own. For the avid crawfish cooker, when using a traditional circle crawfish pot, it can be tiresome and sometimes difficult to cook the crawfish, grab the heavy metal pot with steam filling the air around your face and pour it into a container hoping you don't spill the crawfish or hot water. With the Crawfish Cooker, take all the worry out of spillage and in less time than the traditional crawfish cooker to make 2 sacks of crawfish up to 70 lbs with the large. 3/4" Drain valve gives the user an easy clean-up and ALL aluminum construction resists heat better than traditional steam pots making the handles easier to handle. With this cooker crawfish will easily cook while you enjoy the company of friends and family. Even if you live in another part of the country and prefer a different shellfish like crabs, shrimp or lobster, the seafood cooker is aimed to please at your next outdoor get together. 1.) Hook up your container to a propane tank. 2.) Find out if your crawfish have been purged. If they haven’t, soak in fresh water for 10 minutes to clean their exterior and cause them to spit up the swampy muck in their intestines. 3.) 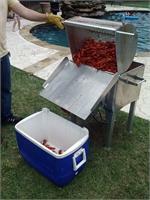 While you’re waiting, fill the crawfish cooker (fitted with a strainer insert) halfway with water and bring to a boil. Add seasoning. 4.) Add your seasoning, potatoes, onions, corn-on-the-cob, sausage or whatever you would like in with your crawfish. 5.) Remove the basket and set down on the ground. 6.) Add up to two bags of crawfish (total weight up to 70 lbs) into the aluminum basket being sure to spread the mudbugs evenly. 7.) With the help of two people if the basket is too heavy, each person grab a handle and place the aluminum basket into the boiling water making sure that the handles go into the proper dips on the corners of the cooker. 8.) After 5 minutes turn off the heat, cover, and let the crawfish steep to absorb the flavors for 15 to 20 minutes (if you can resist the amazing aroma). 9.) Avoid the heat by opening the lid towards your crawfish container (what you plan to store them in) and lift the basket towards your container. The crawfish fall out of the basket and slide into your cooler. - Width from handle to handle: 46"
- Length from wheel to wheel: 36"
- Length from handlebar to handlebar of basket: 41"
- Width of basket: 31"x20"
- Handle on cooker: 11"
- Loose handle bar: 41"
Made locally in Southeast Texas where we know how to boil crawfish! If you are local, we have one on our lot to check out for yourself.